Visit friends for a wedding reception in New Hampshire. Included in the photo are 2DG bloggers Kitty, Jeff Wagg, kochanski, and myself. I know people who have furnished their house with antiques and fixtures that they acquired abroad. 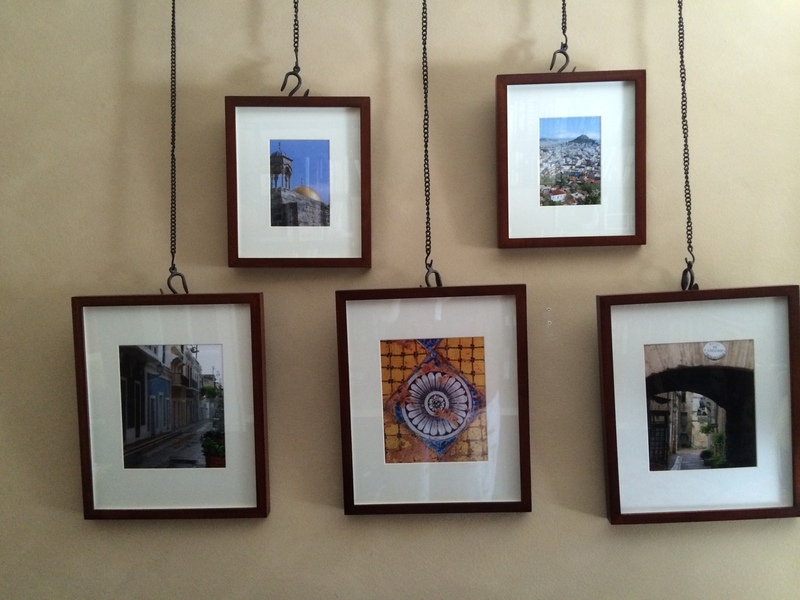 That’s out of my budget. . Here’s how I have collected and displayed some of my trip memories. They need to fit in my carry-on! Photo prints from travels. Hanger system from Pottery Barn. If you look at the second photo above in the lower right-hand corner, you might be able to tell that it’s a picture of a corner sidewalk cafe, taken in Paris by my son Richard. My other son Travis and I were sitting at the table have a mid-day snack. 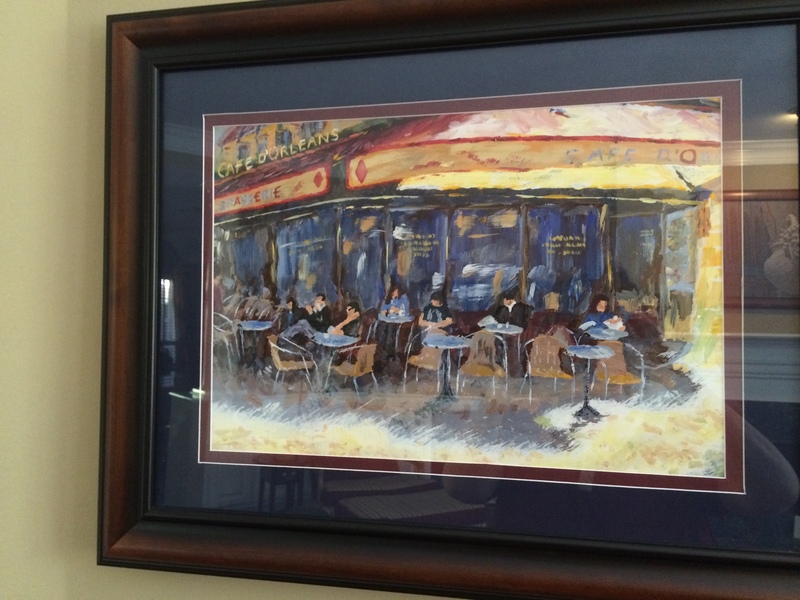 A couple of years ago, I received this watercolor, painted by Richard and framed by Travis. Sorry for the bit of glare from the glass, but I didn’t want to remove to photograph. Family at Cafe, in Paris. Painted by Richard Orbeck, acrylic on canvas. I’m in the middle in blue, and Travis is to the right of me. The photo below is from a fish vendor in Paris. 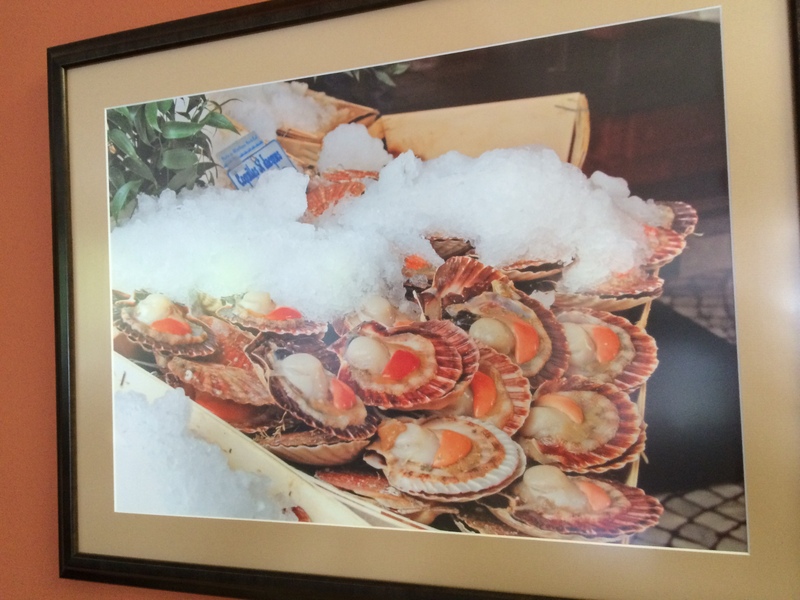 Kitty took this picture, and when I saw it, it reminded me very much of buying scallops at a market in Montmartre, before I knew Kitty! I asked to buy a copy, but she graciously let me use it free of charge. It’s hanging in my kitchen. Fresh market scallops in Paris. Photo by kitty lapin agile. My next post will be about some of the other items I have collected from my trips. How do you display your souvenirs? That’s really nice Naomi. I used to scrap book all my travel photos and discovered that I was the only person looking at the books. 😦 So much time wasted. I take thousands of photos each year and am attached to most of them. Now I use them as screen savers on my computer so I can see them all the time. I sometimes will print them out and use them in misc frames around the house, but even still I can’t keep up. 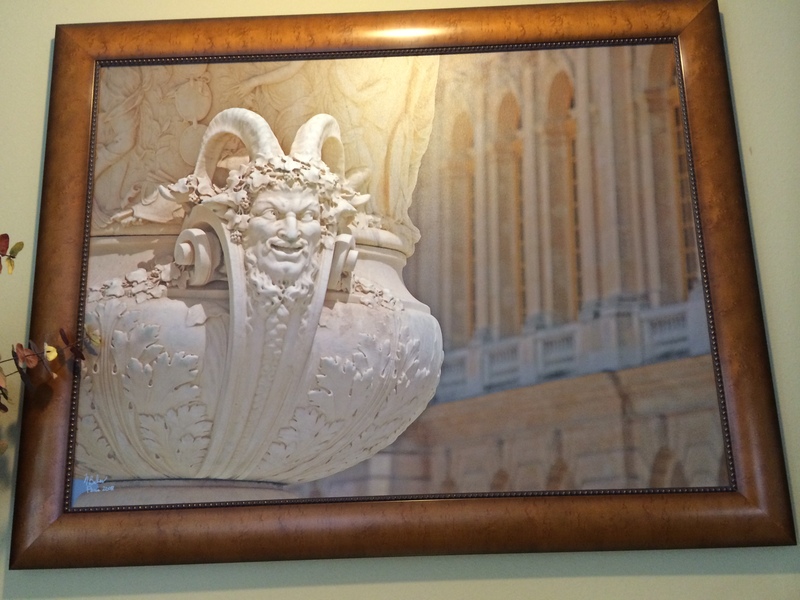 I love the idea you had with the Pottery Barn frames, very pretty. I have to pick and choose what to display, since my house has more windows and open spaces than walls! Next week I’m posting about how I handle things other than photos. 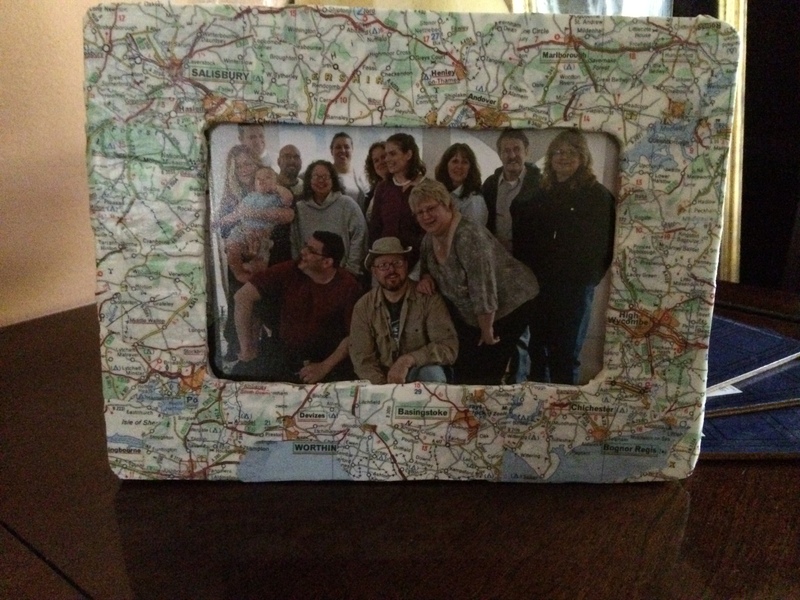 the Pottery Barn frames are great. 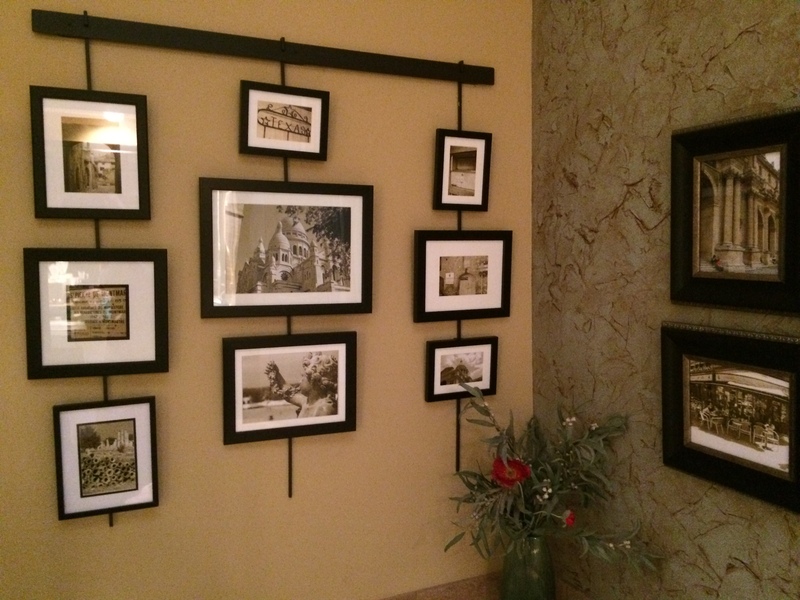 You can fill a large space, with affordable sized photos.